I get asked a lot how Mazen learned to eat healthy foods like kale salad, mussels and asparagus. Just as every child has a different temperament, I don’t think there is a one-size-fits-all formula to encourage healthy eating in kids. However, I can share my story in the hope that it might help your kids too! Here are ten things that Matt and I (and Thomas and our extended family) have done this year to encourage healthy eating. Waited patiently. Mazen was a very healthy eater from ages 6 months to about 2 years old. He gobbled down veggies as a baby and loved No Bull Burgers (made from lentils and cooked vegetables) and smoked salmon. Then, as most kids do, he went through a very picky phase. While I didn’t resort to completely bland kids foods, I stopped trying a lot of green things because I was tired of making them and wasting them (I could eat some leftovers but most of them got tossed on the floor!). My plan: wait it out. So years 2 and 3 were quite picky, although he did still have some healthy foods he’d eat like yogurt, broccoli with parmesan cheese, and spinach on pizza. Made him a sous chef. When he was finally old enough to follow simple instructions in the kitchen, we started to get him more involved. 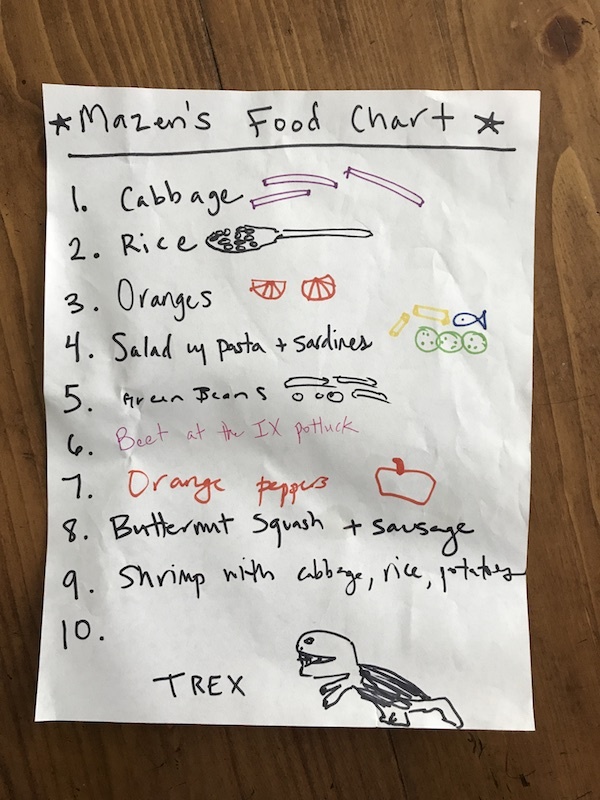 I have to give major props to Matt on this one because he does an awesome job cooking with Mazen. I am not as good with that at my house, but cooking with Matt was one of the big catalysts for getting Mazen to try new foods. He’d make something with Matt, like mushrooms on pizza, and then I would piggyback on that and repeat the same food that week. It worked because it was fresh in his mind. My goal with healthy eating has always been exposure, exposure, exposure, so just seeing it and talking about it was a win, even if he refused to try it. So whichever parent (or grandparent or role model) can get your child most excited about cooking, have them kick things off. We also get Mazen involved in the shopping and ask him what vegetables he’s in the mood for, and that helps too! Emphasized family dinners. I know in an ideal world the family should enjoy a well-balanced dinner together every night, but that is unrealistic for us all the time. Mazen couldn’t wait past 5:30 to eat, and I never wanted to eat that early, so when he was younger I compromised and used to make him a separate early dinner. But around age 4, I decided he was old enough to wait a bit, so I started giving him a healthy-ish snack around 5 and serving dinner between 6 and 6:30 (I met in the middle on time since the grown-ups used to eat at 7:30 or so). He complained at first about sitting down with us and about the food I prepared, but after a few weeks of realizing I wasn’t bending, the whining minimized and then went away. He is definitely more likely to eat what we’re eating when we eat together. We don’t eat together every night because of having two households and activities, but we try to do it 3-4 nights a week. Asked his opinion. I ask Mazen most nights, “Which vegetable do you want tonight?” It’s the classic parent trick of switching the question from “Do you want a…” to “WHICH one do you want…” They get to decide and pick something they’re in the mood for. This doesn’t always work (if I’m preparing a family meal with limited choices, for example) but I ask whenever I can. For example, if I’m making quesadillas, I’ll ask which vegetable he wants inside (choices might be bell peppers, spinach, or kale). Kept my tone casual. If he’s not eating something on his plate, I remind him that he doesn’t have to eat anything he doesn’t want to, but that he can’t have any second helpings of his favorite thing on the plate (or any dessert if that’s an option) unless he eats the vegetables. I keep my tone casual and “no big deal” style. Generally, when he realizes this, he’ll eat the vegetable in order to get what he wants. Let him mix healthy with not-so-healthy. Since exposure, exposure, exposure was my goal, I have been flexible and open minded about Mazen’s wishes. Matt loves mayo and Mazen loves it too. If he wants to dip his nutritious kale salad in a glob of mayo, so be it. I am just happy he eats the kale! Because the more exposure he gets to it, the better it is in the long run. Talked about simple nutrition. Mazen has really been into Superheroes this year, and so he wants to be strong. We talk about how vegetables make you strong, and fruits, grains, and water give you energy to run fast. But sugar slows you down! Sugar isn’t bad, but it doesn’t really help the body grow or get stronger either. Sometimes if you eat too much sugar you have to focus on healthy foods for a while to build your body back up. Mazen has asked me questions about certain foods (“What does meat do?”) and I try to answer in my most simple language (“It’s made of protein and helps your muscles grow.”). Offered boring snacks. Now, before you think I am getting holier than thou, my child eats plenty of Goldfish and “kid snacks”. But when he’s in a snacky mood, I give him three options that I consider to be very healthy: almonds, carrots, yogurt, Mini Babybel cheese, or a popsicle (which is a frozen smoothie, so made with good stuff). If he rejects them all, then I know he’s not really that hungry and is just chasing after some junkier foods. He also knows that if he doesn’t eat his dinner his options for a bedtime snack are slim — carrots or almonds. If he’s really hungry, he will take one of those. Let him be a kid. When I was young, I ate pixie sticks and rock candy and ring pops and Skittles. I don’t want to deprive him of getting to experience these, so I relax a bit and let him enjoy some of these treats when the occasion suits. Nutrition is important, but so is being a kid! And life is all about balance, anyways. I certainly don’t have all the answers, and might be doing something that goes against what the experts recommend. 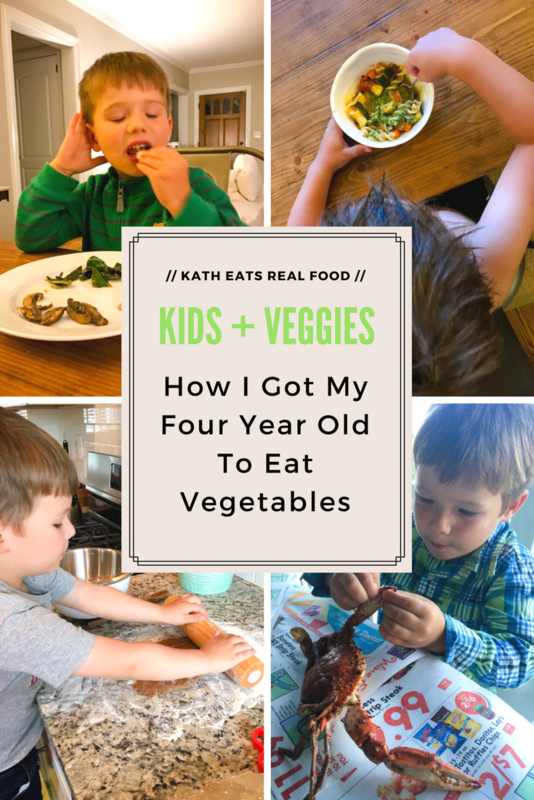 But knowing my own child’s temperament, we have made huge strides towards eating a diverse array of vegetables (and healthy foods in general like fish and brown rice) this year. No parent’s choices will be perfect, and Mazen doesn’t jump up and down for vegetables (except for spinach pizza!). But the difference in his attitude towards healthy food between ages three and a half and almost five is huge. You’ve got parenting down! I actually really used to love eating veggies when I was young. Must’ve been abnormal, haha! I wouldn’t worry that much about protein if she is eating some of those – kids don’t need a lot of it. I’m curious about Raddish! I will check them out. Raddish has been fun – the first month was Spanish themed and we made some Tapas, a simplified Paella, and Churros. The summer boxes have been a little more “fun” themed, but I’m curious to see if we get back to a more regional cooking theme in September. They also give you a bunch of links online to learn more about whatever the theme of the month is. Wonderful to hear that! I think it really all comes down to what you feed your baby in the womb, and also what you feed the baby right after giving birth. Everything is an acquired taste. If you never expose them to harmful toxins I never develop the addiction to things such as sugar. Vegetables have lots of protein in them! It’s a common misconception that protein must always = meat. I’m not a vegetarian but have been learning more about this. Have you seen “What the Health?” Proceed with caution, just like any other documentary on this topic, but an interesting one to check out. I really like the “boring snacks” idea, especially at certain times of the day. My kids are 6 and almost 4, About a year and a half ago, we started a thing that we call “veggie snack.” While we make dinner, we serve each kid a plate of raw veggies, and they are allowed to choose their one daily TV show to watch together. (Currently, they have to take turns choosing since they don’t always agree.) This has a couple benefits: they’re getting a good serving or two of veggies before the rest of their dinner is the obvious one. It can also help cut down on the early evening snack demands, because after a certain point we can just say no, it’s too close to dinner, but don’t worry, it’s almost veggie snack time. We also do the “you don’t have to eat it, but you can’t have seconds/thirds/etc of pasta if you haven’t eating some protein and veggies, too” thing. We don’t do the “clean plate club” stuff that our generation was raised on, but we do talk about having a balanced meal and ask them what they’re going to eat to balance out their plate. Agree on all of this. Good tips! LOVE the veggie snack idea! Definitely starting this. Great tips! And yes, I agree, being a kid is important too. Us 80s kids definitely ate candy, drank Kool-Aid, etc. … haha! These are great tips! I don’t have any kids yet but I’m an RD that loves to cook so I often wonder how that’s all going to go … I need to save these ideas for my future 😉 Great job momma! Love these ideas! Thanks for the inspo! I hardly ever comment on blogs, but I just have to say how much I appreciate the positivity in this post: your creative and positive approach to parenting, the way you cooperate with Matt in parenting and talk so positively about him, the way you include Thomas and your extended family, and the fact that you acknowledge that every child is unique and invite everyone to share their own experiences and what works for them. Your attitude and approach are so refreshing! I agree. This was a good post: personal, informative, non-commercial. More like this please! Totally saving this for later! My son is 8 months old and I am so keen for him to have a healthy and happy relationship with food. Food is fun but also has an important purpose! My mom is an RD and she really instilled a love of healthy food in me, but until very recently, ‘unhealthy’ food made me feel really guilty. My husband loves all food and he has been great about helping me achieve balance. Now that we have the boy, I am always looking for ideas to ensure he doesn’t inherit the guilt, but retains the love of healthy stuff…. Awesome tips and advice! Will definitely use your article as guidance for my kids, thanks for the share! One tip I picked up along the way is “offer an anchor food.” So if our family is having salmon and quinoa (not my three year old’s favorite) I will make sure he has avocado or some other nutrious, familiar and liked food on his plate. I haven’t heard it called “anchor food” but I know what you mean, and that is a great term! I have an almost-two year old and I loved this post! I especially love your repeated exposures strategy and try to do the same with my little one. These are such great tips! I’m going to save this post in my Evernote account and re-surface it in like 5ish years 😉 I’m not a mama yet, but these all seem like such practical and creative ways to incorporate a variety of foods into a toddler’s diet. Thank you, Kath! You’re doing a fine job! All indications are that you’re a great mother! This is my favorite post ever! So helpful. Thank you! We made a chart with our names on it,like a graph, and colored in all the colors of the different fruits and vegetables we ate. We had a contest to see who ate the most, and my four year old won. Plus it was fun for him to color it in. I like the list you made of new foods Mazen tries. Does he have to eat them or just try them? We have also had success with giving foods voices and feelings…. Feeling sad that no one was eating them. But mostly we keep it low key, and if he has tried dinner and doesn’t like it, he can have cereal and milk, which really only happens a couple of times a month. The color chart is a wonderful idea! Such good words of wisdom! My daughter is only one but we continue to have her try new foods and repeat foods she didn’t “like”. Through exposure she usually ends up liking it in the future. I completely agree with the garden suggestion. My girls will race outside to check the garden and actually eat the vegetables before they ever make it inside. If I had suggested vegetables for breakfast, the idea would have been shot down. But if it is something they grew and they’ve been anticipating for weeks, that vegetable is gobbled down first thing in the morning! The same is true for herbs… we’re to the point now that sometimes when we’re eating dinner, one will decide dinner needs a little bit more flavor, color, etc, and they run outside to grab a handful of herbs to “add” to their dinner. To suddenly have kids go MIA from the family dinner table isn’t the best situation, but I laugh that they race back as fast as they can to “modify” their dinner! Thanks so much for sharing, I have an almost three years old who is similar to Mazen and hope that her attitude towards green vegetables change. For now I just get to hear “I’ll like it when I’m older, mom” haha, what a kid! This is great! Can you do a post on what you pack for M’s school lunch? Especially since school is starting again? I just did! Although not with photos and more details. Generally I do a half sandwich (sunbutter or sometimes turkey) and then fill up the other slots with sides. I aim for a whole grain, a fruit, a dairy, and a veggie. Sometimes I don’t get them all in, but that’s my goal. It sounds like you have really thought about your approach to (mostly) healthy eating with your son. I work with young children and after growing up with some serious food guilt/shame issues that led to a long-term disorder, have become professionally involved and invested in helping children develop healthy-as-possible attitudes towards many things including food. From my view, no. 3 and no. 6 on your list – creating an rewards chart for eating healthy foods, which is inherently value-based, and being “casual” – seem to conflict. Certainly, you and your ex-husband know your son best, and incentive charts can be great tools for some things; however, best practices and medical as well as psychological professionals (including this one) suggest that you should not associate food with any sort of reward system. As I’m sure you know, children as well as adults have tastes that change over times and people of all ages need to try foods many times before they develop a taste for them one way or another – but rewarding a child for eating certain foods is dangerous. I hope you’ll chew on (no pun intended) and consider it. This was good for me to re-read! My almost 2 year old is in a huge picky stage and most of his fruit and veggies still come from applesauce and tots packets!